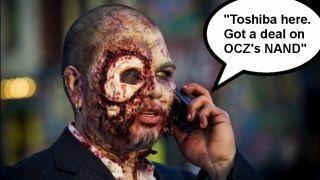 It's extra life time for bankrupt SSD maker OCZ, which has seen its assets snapped up by NAND-hungry, Japan-based tech giant Toshiba. Under the freshly stamped acquisition agreement, Toshiba will swallow up the California-based company's "controllers, firmware and software, as well as the teams responsible for bringing these solutions to market, in addition to OCZ's established brand and sales channels" for $35 million (around £57.2 million, or AU$63.5 million). Toshiba taking on OCZ's workforce was one of the conditions laid out as part of the acquisition, along with not letting the company's finances further plummet and accepting the highest offer in the bankruptcy court. OCZ, which hasn't posted an annual profit in five years, achieved revenue of $33.5 million for its most recent quarter, down from $88.6 million one year ago. In a statement, OCZ chief Ralph Schmitt said that the past year has caused the company "numerous issues which have stressed the company's capital structure and operating model, posing a challenge to achieving near term profitability", adding that it has struggled to keep costs of NAND flash down in the face of dwindling supply caused by increasing competition from smartphone and tablet manufacturers. Toshiba, which is already deeply seated within the SSD business, will unify the two companies intellectual property and NAND supply under one global organization, according to the statement, which OCZ said will make it a more competitive unit in the future. The SSD battleground is poised to hot up in the coming years, according to analyst house Gartner, which predicts that the market will grow from a value of of $390 million (£238 million, or AU$427 million) in 2012 to $4 billion ($2.4 billion, or AU$2.7 billion) by 2016.